This article is about the ancient Roman road. For other uses, see Appian Way (disambiguation). "the Appian Way the queen of the long roads"
The Appian Way was used as a main route for military supplies since its construction for that purpose in 312 B.C. Romans had an affinity for the people of Campania, who, like themselves, traced their backgrounds to the Etruscans. The Samnite Wars were instigated by the Samnites when Rome attempted to ally itself with the city of Capua in Campania. The Italic speakers in Latium had long ago been subdued and incorporated into the Roman state. They were responsible for changing Rome from a primarily Etruscan to a primarily Italic state. Dense populations of sovereign Samnites remained in the mountains north of Capua, which is just north of the Greek city of Neapolis. Around 343 BC, Rome and Capua attempted to form an alliance, a first step toward a closer unity. The Samnites reacted with military force. Between Capua and Rome lay the Pontine Marshes (Pomptinae paludes), a swamp infested with malaria. A tortuous coastal road wound between Ostia at the mouth of the Tiber and Neapolis. The Via Latina followed its ancient and scarcely more accessible path along the foothills of Monti Laziali and Monti Lepini, which are visible towering over the former marsh. In the First Samnite War (343–341 BC) the Romans found they could not support or resupply troops in the field against the Samnites across the marsh. A revolt of the Latin League drained their resources further. They gave up the attempted alliance and settled with Samnium. The Romans were only biding their time while they looked for a solution. The first answer was the colonia, a "cultivation" of settlers from Rome, who would maintain a permanent base of operations. The Second Samnite War (327–304 BC) erupted when Rome attempted to place a colony at Cales in 334 and again at Fregellae in 328 on the other side of the marshes. The Samnites, now a major power after defeating the Greeks of Tarentum, occupied Neapolis to try to ensure its loyalty. The Neapolitans appealed to Rome, which sent an army and expelled the Samnites from Neapolis. In 312 BC, Appius Claudius Caecus became censor at Rome. He was of the gens Claudia, who were patricians descended from the Sabines taken into the early Roman state. He had been given the name of the founding ancestor of the gens. He was a populist, i.e., an advocate of the common people. A man of inner perspicacity, in the years of success he was said to have lost his outer vision and thus acquired the name caecus, "blind". Without waiting to be told what to do by the Senate, Appius Claudius began bold public works to address the supply problem. An aqueduct (the Aqua Appia) secured the water supply of the city of Rome. By far the best known project was the road, which ran across the Pontine Marshes to the coast northwest of Naples, where it turned north to Capua. On it, any number of fresh troops could be sped to the theatre of operations, and supplies could be moved en masse to Roman bases without hindrance by either enemy or terrain. It is no surprise that, after his term as censor, Appius Claudius became consul twice, subsequently held other offices, and was a respected consultant to the state even during his later years. The road achieved its purpose. The outcome of the Second Samnite War was at last favorable to Rome. In a series of blows the Romans reversed their fortunes, bringing Etruria to the table in 311 BC, the very year of their revolt, and Samnium in 304. The road was the main factor that allowed them to concentrate their forces with sufficient rapidity and to keep them adequately supplied, wherein they became a formidable opponent. The main part of the Appian Way was started and finished in 312 BC. The road began as a leveled dirt road upon which small stones and mortar were laid. Gravel was laid upon this, which was finally topped with tight fitting, interlocking stones to provide a flat surface. The historian Procopius said that the stones fit together so securely and closely that they appeared to have grown together rather than to have been fitted together. The road was cambered in the middle (for water runoff) and had ditches on either side of the road which were protected by retaining walls. The road began in the Forum Romanum, passed through the Servian Wall at the porta Capena, went through a cutting in the clivus Martis, and left the city. For this stretch of the road, the builders used the via Latina. 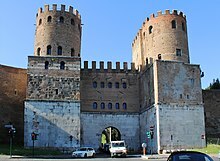 The building of the Aurelian Wall centuries later required the placing of another gate, the Porta Appia. Outside of Rome the new via Appia went through well-to-do suburbs along the via Norba, the ancient track to the Alban hills, where Norba was situated. The road at the time was a via glarea, a gravel road. The Romans built a high-quality road, with layers of cemented stone over a layer of small stones, cambered, drainage ditches on either side, low retaining walls on sunken portions, and dirt pathways for sidewalks. The via Appia is believed to have been the first Roman road to feature the use of lime cement. The materials were volcanic rock. The surface was said to have been so smooth that you could not distinguish the joints. The Roman section still exists and is lined with monuments of all periods, although the cement has eroded out of the joints, leaving a very rough surface. The road concedes nothing to the Alban hills, but goes straight through them over cuts and fills. The gradients are steep. Then it enters the former Pontine Marshes. A stone causeway of about 31 kilometers (19 mi) led across stagnant and foul-smelling pools blocked from the sea by sand dunes. Appius Claudius planned to drain the marsh, taking up earlier attempts, but he failed. The causeway and its bridges subsequently needed constant repair. No one enjoyed crossing the marsh. In 162 BC, Marcus Cornelius Cathegus had a canal constructed along the road to relieve the traffic and provide an alternative when the road was being repaired. Romans preferred using the canal. The Via Appia picked up the coastal road at Tarracina (Terracina). However, the Romans straightened it somewhat with cuttings, which form cliffs today. From there the road swerved north to Capua, where, for the time being, it ended. Caudine Forks was not far to the north. The itinerary was Aricia (Ariccia), Tres Tabernae, Forum Appii, Tarracina, Fundi (Fondi), Formiae (Formia), Minturnae (Minturno), Suessa, Casilinum and Capua, but some of these were colonies added after the Samnite Wars. The distance was 212 kilometers (132 mi). The original road had no milestones, as they were not yet in use. A few survive from later times, including a first milestone near the porta Appia. The Third Samnite War (298–290 BC) is perhaps misnamed. It was an all-out attempt by all the neighbors of Rome: Italics, Etruscans and Gauls, to check the power of Rome. The Samnites were the leading people of the conspiracy. Rome dealt the northerners a crushing blow at the Battle of Sentinum in Umbria in 295. The Samnites fought on alone. Rome now placed 13 colonies in Campania and Samnium. It must have been during this time that they extended the via Appia 35 miles beyond Capua past the Caudine forks to a place the Samnites called Maloenton, "passage of the flocks". The itinerary added Calatia, Caudium and Beneventum (not yet called that). Here also ended the Via Latina. By 290 BC, the sovereignty of the Samnites had ended. The heel of Italy lay open to the Romans. The dates are somewhat uncertain and there is considerable variation in the sources, but during the Third Samnite War the Romans seem to have extended the road to Venusia, where they placed a colony of 20,000 men. After that they were at Tarentum. Roman expansion alarmed Tarentum, the leading city of the Greek presence (Magna Graecia) in southern Italy. They hired the mercenary, King Pyrrhus of Epirus, in neighboring Greece to fight the Romans on their behalf. In 280 BC the Romans suffered a defeat at the hands of Pyrrhus at the Battle of Heraclea on the coast west of Tarentum. The battle was costly for both sides, prompting Pyrrhus to remark "One more such victory and I am lost." Making the best of it, the Roman army turned on Greek Rhegium and effected a massacre of Pyrrhian partisans there. Rather than pursue them, Pyrrhus went straight for Rome along the via Appia and then the Via Latina. He knew that if he continued on the via Appia he could be trapped in the marsh. Wary of such entrapment on the Via Latina also, he withdrew without fighting after encountering opposition at Anagni. Wintering in Campania, he withdrew to Apulia in 279 BC, where, pursued by the Romans, he won a second costly victory at the Battle of Asculum. Withdrawing from Apulia for a Sicilian interlude, he returned to Apulia in 275 BC and started for Campania up the Roman road. Supplied by that same road, the Romans successfully defended the region against Pyrrhus, crushing his army in a two-day fight at the Battle of Beneventum in 275 BC. 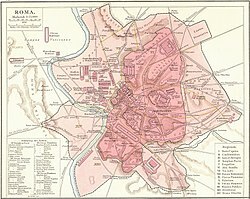 The Romans renamed the town from "Maleventum" ("site of bad events") to Beneventum ("site of good events") as a result. Pyrrhus withdrew to Greece, where he died in a street fight in Argos in 272 BC. Tarentum fell to the Romans that same year, who proceeded to consolidate their rule over all of Italy. The Romans pushed the via Appia to the port of Brundisium in 264 BC. The itinerary from Beneventum was now Venusia, Silvium, Tarentum, Uria and Brundisium. The Roman Republic was the government of Italy, for the time being. Appius Claudius died in 273, but in extending the road a number of times, no one has tried to displace his name upon it. The Appian Way's path across today's regions Lazio and Campania has always been well known, while the exact position of the part located in Apulia (the original one, not the extension by Trajan) was unknown, since there were no visible remains of the Appian Way in that region. In the first half of the 20th century, the professor of ancient Roman topography Giuseppe Lugli managed to discover, with the then innovative technique of photogrammetry, what probably was the route of the Appian Way from Gravina in Puglia (Silvium) up to Taranto. When analysing aerophotogrammetric shots of the area, Lugli noticed a path (Italian: tratturo) named la Tarantina, whose direction was still largely influenced by the centuriation; this, according to Lugli, was the path of the Appian Way. This path, as well as the part located in today's Apulia region, was still in use in the Middle Ages. A further piece of evidence for Lugli's proposed path is the presence of a number of archaeological remains in that region, among them the ancient settlement of Jesce. By studying the distances given in the Antonine Itinerary, Lugli also assigned the Appian Way stations Blera and Sublupatia (which also occurs on the Tabula Peutingeriana) respectively to the areas Murgia Catena and Taverna (between masseria (estate farmhouse) S. Filippo and masseria S. Pietro). However, the toponym Murgia Catena defined too large an area, so that it didn't allow a clear localization of the Appian Way station. Recently Luciano Piepoli, based on the distances given in the Antonine Itinerary and on recent archeological findings, has suggested that Silvium should be Santo Staso, an area very close to Gravina in Puglia, Blera should be masseria Castello, and Sublupatia should be masseria Caione. The emperor Trajan built the Via Traiana, an extension of the Via Appia from Beneventum, reaching Brundisium via Canusium and Barium rather than via Tarentum. This was commemorated by an arch at Beneventum. Travellers could cross the Adriatic Sea through the Otranto Strait towards Albania either by landing at present day Durrës through the Via Egnatia or near ancient town of Apollonia and continue towards present day Rrogozhina in central Albania. Emperor Trajan built a deviation of Via Appia. This is a tract of Via Appia Traiana near Egnatia. In 73 BC, a slave revolt (known as the Third Servile War) under the ex-gladiator of Capua, Spartacus, began against the Romans. Slavery accounted for roughly every third person in Italy. Spartacus defeated many Roman armies in a conflict that lasted for over two years. While trying to escape from Italy at Brundisium he unwittingly moved his forces into the historic trap in Apulia/Calabria. The Romans were well acquainted with the region. Legions were brought home from abroad and Spartacus was pinned between armies. The ex-slave army was defeated at Siler River by Crassus. Pompey's armies captured and killed several thousand rebels that escaped from the battle and Crassus captured several thousand more. The Romans judged that the slaves had forfeited their right to live. In 71 BC, 6,000 slaves were crucified along the 200-kilometer (120 mi) Via Appia from Rome to Capua. Hoping to break a stalemate at Monte Cassino, the Allies landed on the coast of Italy at Nettuno, ancient Antium, which was midway between Ostia and Terracina. They found that the place was undefended. They intended to move along the line of the via Appia to take Rome, outflanking Monte Cassino, but they did not do so quickly enough. The Germans occupied Mounts Laziali and Lepini along the track of the old Via Latina, from which they rained down shells on Anzio. Even though the Allies expanded into all the Pomptine region, they gained no ground. The Germans counterattacked down the via Appia from the Alban hills in a front four miles wide, but could not retake Anzio. The battle lasted for four months, one side being supplied by sea, the other by land through Rome. In May 1944, the Allies broke out of Anzio and took Rome. The German forces escaped to the north of Florence. For the 1960 Summer Olympics, it served as part of the men's marathon course that was won by Abebe Bikila of Ethiopia. After the fall of the Western Roman Empire, the road fell out of use; Pope Pius VI ordered its restoration. A new Appian Way was built in parallel with the old one in 1784 as far as the Alban Hills region. The new road is the Via Appia Nuova ("New Appian Way") as opposed to the old section, now known as Via Appia Antica. The old Appian Way close to Rome is now a free tourist attraction. It was extensively restored for Rome's Millennium and Great Jubilee celebrations. The first 5 kilometers (3 mi) are still heavily used by cars, buses and coaches but from then on traffic is very light and the ruins can be explored on foot in relative safety. The Church of Domine Quo Vadis is in the second mile of the road. Along or close to the part of the road closest to Rome, there are three catacombs of Roman and early Christian origin and one of Jewish origin. The construction of Rome's ring road, the Grande Raccordo Anulare or GRA, in 1951 caused the Appian Way to be cut in two. More recent improvements to the GRA have rectified this through the construction of a tunnel under the Appia, so that it is now possible to follow the Appia on foot for about 16 km (10 mi) from its beginning near the Baths of Caracalla. Many parts of the original road beyond Rome's environs have been preserved, and some are now used by cars (for example, in the area of Velletri). The road inspires the last movement of Ottorino Respighi's Pini di Roma. To this day the Via Appia contains the longest stretch of straight road in Europe, totaling 62 km (39 mi). For an overview of the location of Roman bridges, see List of Roman bridges. There are the remains of several Roman bridges along the road, including the Ponte di Tre Ponti, Ponte di Vigna Capoccio, Viadotta di Valle Ariccia, Ponte Alto and Ponte Antico. ^ Povoledo, Elisabetta (April 5, 2008). "Past Catches Up With the Queen of Roads". New York Times. Retrieved 2008-04-05. In ancient times the Appian Way, which links Rome to the southern city of Brindisi, was known as the regina viarum, the queen of the roads. But these days its crown appears to be tarnished by chronic traffic congestion, vandalism and, some of its guardians grumble, illegal development. ^ "Appian Way" in Chambers's Encyclopædia. London: George Newnes, 1961, Vol. 1, p. 490. ^ Tingay, G.I.F., and J. Badcock. These Were The Romans. ed. Chester Springs, Pennsylvania: Dufour Editions, Inc., 1989. ^ 1960 Summer Olympics official report. Archived 2008-10-31 at the Wayback Machine Volume 1. pp. 80–81. ^ 1960 Summer Olympics official report. Archived 2008-05-27 at the Wayback Machine Volume 2. Part 1. pp. 117–8. ^ Magli, Giulio (2007). "Astronomical references in the planning of ancient roads". arXiv:0706.1325 [physics.hist-ph]. Berechman, Joseph. 2003. "Transportation––Economic Aspects of Roman Highway Development: The Case of Via Appia." Transportation Research Part A 37, no. 5: 453-78. Coarelli, Filippo. 2007. Rome and environs: An archaeological guide. Translated by James J. Clauss and Daniel P. Harmon. Berkeley: Univ. of California Press. Della Portella, Ivana. 2004. The Appian Way: From Its Foundation to the Middle Ages. Los Angeles: J. Paul Getty Museum. Dubbini, Rachele. 2016. "A New Republican Temple on the Via Appia, at the Borders of Rome's Urban Space." Journal of Roman Archaeology 29: 327-47. Kleijn, M. de, R. de Hond, and O. Martinez-Rubi. 2016. "A 3D Spatial Data Infrastructure for Mapping the Via Appia." Digital Applications in Archaeology and Cultural Heritage 3: 23-32. Magli, Giulio, Eugenio Realini, Mirko Reguzzoni, and Daniele Sampietro. 2014. "Uncovering a Masterpiece of Roman Engineering: The Project of Via Appia between Colle Pardo and Terracina." Journal of Cultural Heritage 15, no. 6: 665–69. Peterson, John. 2015. "Modelling Roman surveying in the Pontine plain." 1st International Conference on Metrology for Archaeology Benevento, Italy, October 22-23, 2015 445-9. Luciano Piepoli (2014). Il percorso della via Appia antica nell’Apulia et Calabria: stato dell’arte e nuove acquisizioni sul tratto Gravina-Taranto. Vetera Christianorum (in Italian). pp. 239–261. Giuseppe Lugli . La via Appia attraverso l'Apulia e un singolare gruppo di strade "orientate" (PDF) (in Italian). 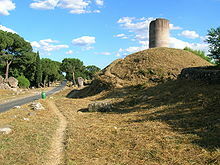 Wikimedia Commons has media related to Via Appia. Ivana Della Portella, Giuseppina Pisani Sartorio, Francesca Ventre. The Appian Way: From Its Foundation to the Middle Ages. Los Angeles, 2004 (Google Books Preview).